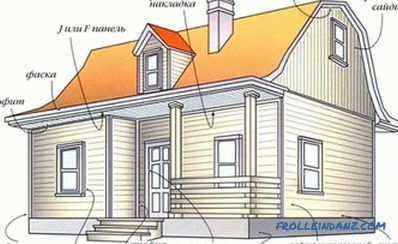 Want to make an attractive continuation of the house? 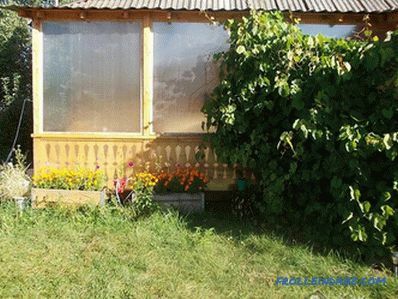 Then you certainly need to do the arrangement of the veranda. One of the inexpensive, but very durable materials used for this is polycarbonate. A little time and diligence and your family will have a unique place to relax and receive guests! 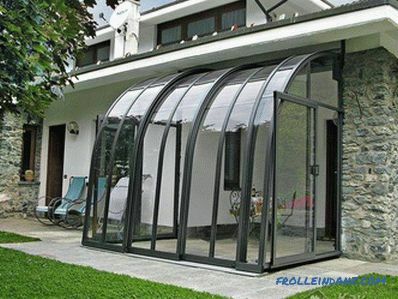 Polycarbonate sheets are now used in various areas of construction, including the construction of a veranda. 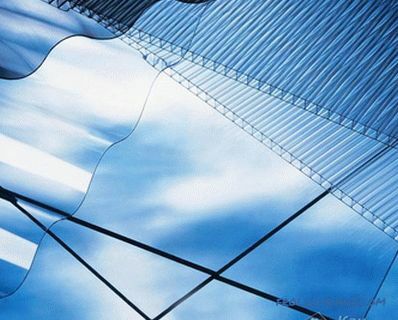 Simple polycarbonate panels usually consist of two layers, between which stiffeners are located. They are located along the sheet. There is air in the voids, which serves as additional thermal insulation. More expensive polycarbonate is characterized by the presence of two or even three layers, which are also separated by stiffeners and voids. Such panels are easy and flexible, perfectly transmit the rays of light. 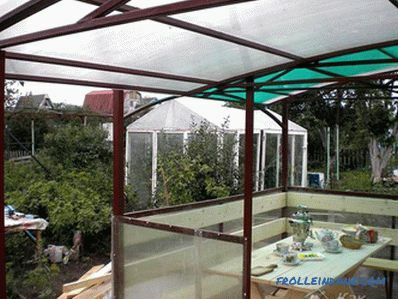 A polycarbonate veranda can be used to grow plants even in the cooler seasons. In no case can this structure be solid. There should be windows for timely airing. If we talk about the types of verandas, there are only two of them: built-in and attached. At the same time, built-in structures are almost always done at the stage of building a house, which implies a common foundation and roof. An exception may be a veranda, which is made on one porch. If this construction is being completed to an already erected and equipped house, then it is already considered to be attached. As for the forms, they can be very different. Sometimes the veranda may resemble a peculiar belt due to its location around the building. But most often this construction is a passage between the entrance to the house and the street. However, if the veranda is planned and equipped as a winter garden, then it usually serves as an exit from only one room. Terrace or open porch. The word "terra" is translated from Latin as "earth." This may be due to the fact that this structure is only slightly elevated above the ground and resembles a compact platform. Over it should be equipped with a roof. Usually, an open veranda, or, as it is commonly called, a terrace is located next to the house or is completely attached to it. Interestingly, such a constructive feature of the veranda visually increases the size of the house. This type of construction is ideal for a southern climate where the warm season is predominant. 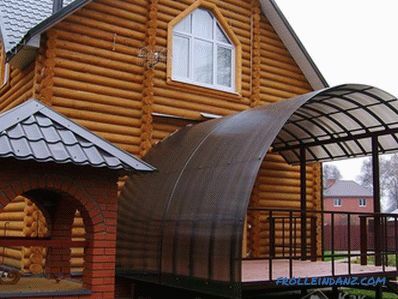 The roof can be made of polycarbonate. Green shrubs and ornamental plants can act as so-called walls. 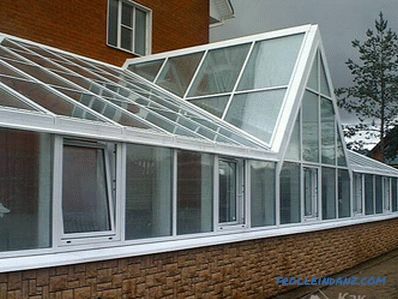 If the climatic conditions in your area are very harsh, then it is preferable to sheathe the building on all sides with polycarbonate sheets. These light walls, of course, will protect against gusting winds. The porch with a sloping roof is usually adjacent to home and serves as a kind of buffer between the building and the street. Due to the dense adjoining of the veranda to the mansion, a stable and rigid roof support is provided. As many believe, it is very convenient that two entrances are built, one from the street and the second from the house. A veranda in the shape of a semicircle is most likely the best option. The beauty of greenery and the beauty of the flowers of the garden, as if framing a semicircular veranda, smoothly moving into it, creates a special panorama of the landscape. 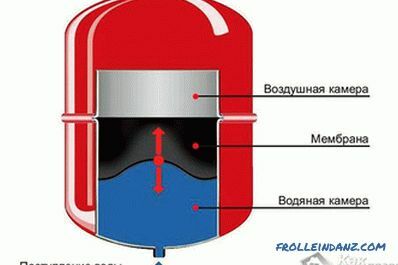 In this case, the foundation should be constructed of concrete blocks, turning the structure into a monolithic tape. For the construction of the frame, you can use solid wood with a rectangular cross section. 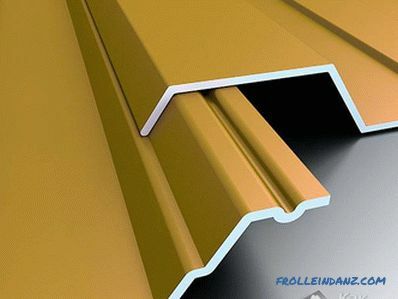 In order to increase the rigidity, stability and reliability of the veranda, both the upper and lower trim must be made of the same beam. Polycarbonate - This is a light material, respectively, and the veranda of it will not be heavy. As a result, when erecting a structure, you can get along with a columnar or strip foundation. Being engaged in the manufacture of the base, you should first make sure that the design of the veranda was fixed on the foundation. As for the frame, it can be made of metal pipes, corners or channels, plastic material and wooden blocks are also relevant here. 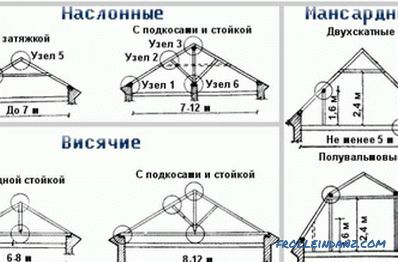 Most often, the roof is made lean-to, having an inclination angle of about 40 °. And, nevertheless, its configuration may be different. 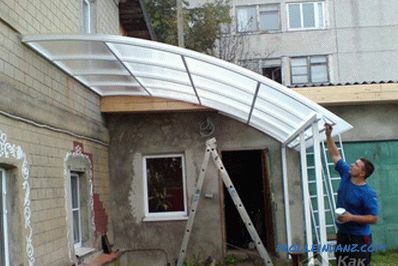 For example, if you decide to build a small porch, then the roof can be made arched, especially since polycarbonate is very flexible and can be bent freely. The skeleton of such an extension should be made already taking into account what will be the roof in the future. The panels should be fixed to the frame using screws and washers. Under each puck, you definitely need to put a rubber gasket. 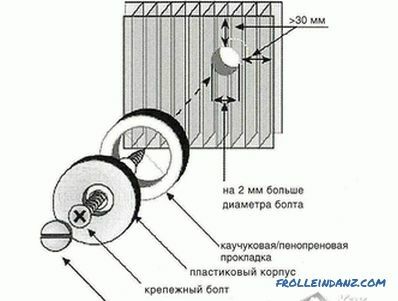 In addition, holes should be drilled for the screws, which exceed the diameter of the screw by no more than 3 mm. 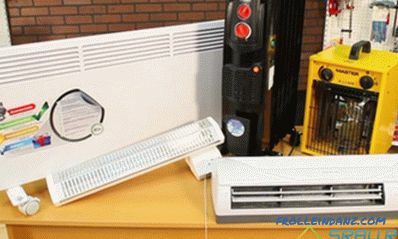 Such values ​​are not chosen by chance: under the influence of heat emanating from the sun, polycarbonate expands, and at low temperatures it narrows. These factors can sway, and accordingly, weaken the mount. 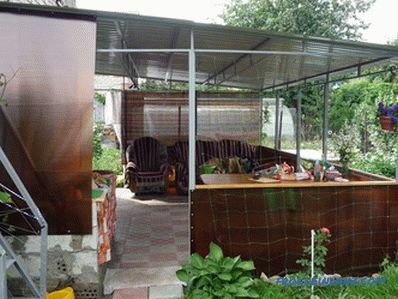 Usually for the construction of a summer terrace, use polycarbonate sheets having a thickness of 0.8 to 1.0 cm. 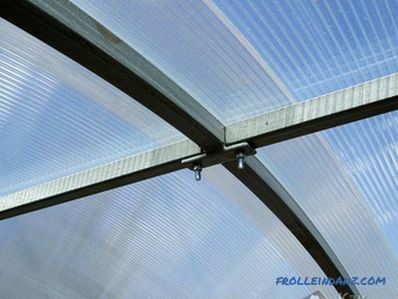 If you plan to build a more durable structure, then use a polycarbonate sheet with a thickness of 1.4 to 1.6 cm. 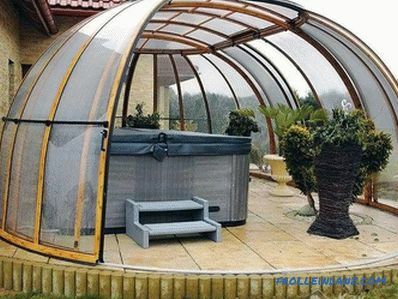 The construction and arrangement of a recreation area made of polycarbonate sheet will take you relatively little time. However, the life of this material is quite long and often reaches 10 years. 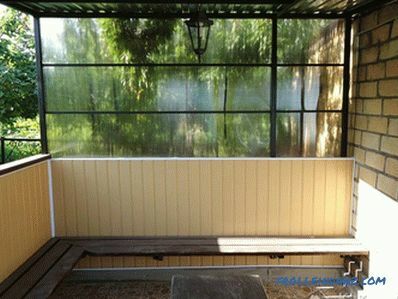 In order to rest on the veranda was comfortable, enough space in 16m 2 . But, if you often invite a lot of guests and like noisy parties, then the veranda is better to do more. 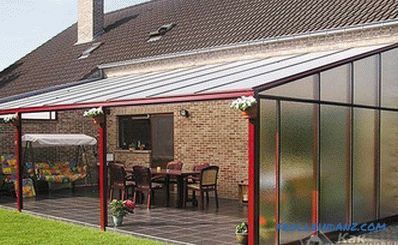 So, do you already have experience building a polycarbonate veranda? What difficulties did you have during the work? What helped you cope with them? Maybe you made a veranda with some kind of individual technology? Share with us your experience, knowledge and skills! Write your comments! a frame pool with your own hands from pvc.